The WTF World Taekwondo Qualification Tournament concluded in a resounding success in Manchester, the United Kingdom on Sept. 30, 2007. No protest was lodged during the three-day event. 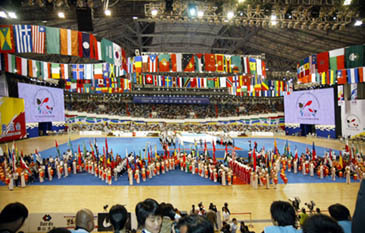 Korea earned a full four berths for the taekwondo competition at the 2008 Beijing Olympic Games after three days of the WTF World Taekwondo Qualification Tournament. France, Cuba, Canada, Italy and Chinese Taipei clinched two places each for the Beijing Olympic Games through the World Qualification Tournament, which took place at the Manchester Evening News (MEN) Arena in downtown Manchester. The tournament drew 328 players from 104 countries, with the attendance of 54 international referees from 41 countries. Ten other countries won one ticket each for the 2008 Olympic Games. They are the United States, Great Britain, Germany, the Philippines, Australia, Mali, Croatia, Greece, Mexico and Thailand. The final day of the Manchester qualification tournament featured two weight categories of the men's -80kg and the women's -57kg. In the men's -80kg category, Canada's Sebastien Michaud placed first, while the United States' Steven Lopez and Italy's Mauro Sarmiento placed second and third, respectively, earning their countries a berth each for the 2008 Beijing Olympic Games. In the women's -57kg division, Korea's Lim Su-jeong placed first, while Italy's Veronica Calabrese and Thailand's Premwaew Chonnapas placed second and third, respectively. A total of 128 athletes are to compete in the taekwondo competition of the 2008 Beijing Olympic Games. Through the World Qualification Tournament, the top three athletes from each of the eight Olympic weight categories, totaling 24, qualify their national Olympic committees a place in the respective event. Through the WTF's five continental qualifications, a total of 96 places, comprising of 48 men's and 48 women's places, will be allocated. Asia, Europe and Pan America will be allocated 24 places each in the same competition format. Africa and Oceania will have 16 and eight places, respectively. The immediate continental qualification is the African Taekwondo Qualification Tournament scheduled for Nov. 1-3 this year in Tripoli, Libya, followed by the Asian qualification Nov. 29-Dec. 2 in Ho Chi Minh City, Vietnam. The Oceania qualification is slated for Dec. 1 in New Caledonia; the Pan-American qualification on Dec. 7-9 in Cali, Colombia; and the European qualification on Jan. 26-27, next year in Istanbul, Turkey.